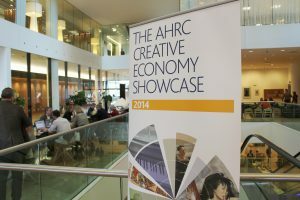 Last Wednesday (12th of March) the Arts and Humanities Research Council assembled over 500 policy-makers, creative industry business leaders, knowledge exchange practitioners, University research directors and senior funding council partners for its Creative Economy Showcase. 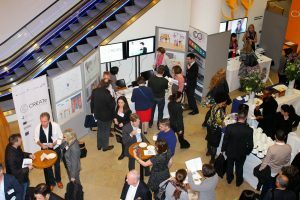 The event, held in the fabulous setting of London’s Kings Gate Conference Centre, was intended to highlight the outcomes and innovations from AHRC’s activities in this area, providing opportunities to debate and influence current top level thinking in the sector, and to facilitate networking. CREATe was of course delighted to contribute – a critical part of its ambitions is to effect real change within those parts of industry, policy and culture that collectively comprise this Creative Economy. CREATe’s participation in the showcase provided a fantastic opportunity to share information on its accomplishments, both completed and forthcoming, and to catalyse its engagement with these key sectors. Our initial proposal to contribute to the event was submitted in November of last year following a call for expressions of interest from the whole consortium. An agreement was quickly reached to promote two of CREATe’s most developed projects, and to join forces with Supporting Creative Business: Cultural Enterprise Office and its Clients, a one-year Creative Economy Knowledge Exchange project, which began in April 2013. 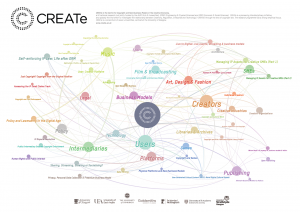 It is run by the Centre for Cultural Policy Research (CCPR) which like CREATe is based at the University of Glasgow. Common themes such as innovation in business models and a shared spirit of delivering genuine knowledge exchange made the collaboration a natural one. For the CREATe team, comprising Director Martin Kretschmer, Deputy Director Philip Schlesinger, CREATe Fellow Kris Erickson, Centre Manager Andrew McHugh, Research Development Manager Sukhpreet Singh, Centre Administrator Diane McGrattan and PhD student Victoria Stobo the day of the showcase began early. With attendees due to arrive at 9 o’clock our bleary eyed team was on-site to begin set up of an exhibition stand from 7 am. We were quickly joined by colleagues from Bournemouth University including Bartolomeo Meletti, Dinusha Mendis, Marcella Favale and Hayleigh Bosher, as well as Berlin-based video producer Marco Bagni. Our exhibition stand provided a platform for the launch of Copyright User, a multimedia education resource aimed at helping media workers and creators understand copyright. A joint collaboration between CREATe and Bournemouth University, Copyright User consists of videos, interactive tools, subject resources, and FAQs, meant for everyone who uses copyright: musicians, filmmakers, performers, writers, visual artists and interactive developers. 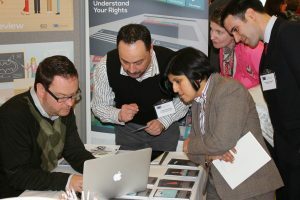 In addition, the stand also hosted a selection of literature documenting CREATe and CCPR’s efforts, a looped presentation and video stream showcasing multimedia content and a suite of handheld devices providing attendees with the opportunity to interact with CREATe’s portfolio of resources, such as the recently released Archives and Copyright online portal. The business of building the exhibition stand had of course begun much earlier than 7 am that morning. Following the AHRC’s confirmation of CREATe’s participation (which was issued in December) our team had quickly set to work. Our proposal incorporated the production of additional video and still-image content; this was swiftly commissioned from Copyright User developers Bartolomeo (Multimedia Production) and his hugely talented creative team of Marco (Art Direction, Design and Animation) and Davide Bonazzi (Illustrations). The content included additional video interviews on copyright issues with media SMEs, adding to the existing portfolio of video resources and the production of a suite of printed material, including posters, bookmarks and a deck of “myth-or-reality” cards. These depicted on either side a common misconception and corresponding truth concerning an individual aspect of copyright. They proved tremendously popular and were lauded by attendees both for the information they offered and their aesthetic appeal. A priority for the exhibition stand was to convey not only the breadth and scale of CREATe’s research, but also to illustrate more clearly the relationships involved. Part of this was about making more explicit the internal links between themes and strands of CREATe’s work (with over forty projects and close to one hundred academic contributors CREATe is clearly a complex undertaking). An even more important aspect (particularly for the Showcase event) was to illustrate CREATe’s external connections; the types of stakeholder groups that we are working with and the broad topical issues with which our work is aligned. In order to accomplish these goals we used CREATe’s intranet (our internal project management platform) to semantically tag each of our projects, investigators and interactions, adding topical descriptors, methodological and disciplinary classifications and sectoral alignments, (to domains such as Music, Film and Broadcasting, Policy, Publishing and Technology). From this data we generated a visualisation which we’ve called the CREATe Network Graphic, a means to see at a glance the range of topics, themes and projects that CREATe comprises, each interconnected, coloured and proportionately weighted to reflect relationships, themes and significance. Like the Copyright User artwork, this was on prominent display at the stand and prompted several interesting discussions. It’s often difficult to distinguish one’s exhibition stand from all the others at events like these, and in order to do so we reflected on ways to inject visual appeal, to turn heads and to promote education in an enjoyable way. 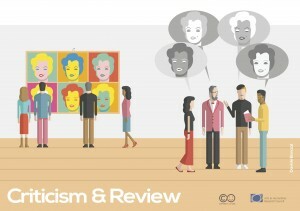 Our discussions arrived at the topic of personalities, and to the question of who might be a charismatic, recognisable and visually arresting representative of copyright. Eschewing more contemporary choices, we were drawn to the UK copyright system’s origins, and to Queen Anne, who lent her name to the Statute of Anne, passed during her reign, the first statute to provide for copyright regulated by the government and courts. 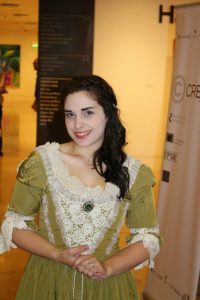 Hayleigh (one of Copyright User’s academic contributors) approached an actress friend named Hannah Banks who was able to perform the role. Clad in elegant period dress, and equipped with a series of fun, copyright history-related facts drafted by CREATe’s founding director Ronan Deazley, Hannah entranced attendees, offering a perspective of copyright’s origins, history and current role both uniquely and effectively. Our breakout session offered an opportunity for CREATe’s director, Professor Martin Kretschmer, to reflect generally on our first year accomplishments before introducing a session that focused on CCPR’s project. 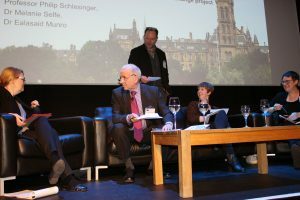 Philip Schlesinger, Melanie Selfe and Ealasaid Munro presented a paper entitled Inside the Agency: Ethnography and Knowledge Exchange, documenting findings and emerging reflections from their research on the Glasgow-based Cultural Enterprise Office (CEO). To demonstrate the knowledge exchange that had taken place, the presentation concluded with CEO’s director, Deborah Keogh, being interviewed about the impact of the research on her organisation. The session provided a tremendous opportunity to show how projects can explore links and the account from Deborah Keogh provided an impressive testimonial to the value of participating in academic research. This breakout session was live-streamed on the day and can be viewed in the Youtube player at the foot of this page. At 5pm the stands began to be disassembled and thoughts turned to the social function that would follow. It was a long but very successful day of activity, and the chance to convene with fellow exhibitors and attendees alike over a glass of wine had been well earned. The sun-lit canal provided a fitting backdrop to reflect upon what had been accomplished, and on the future collaborations and activities that our participation would yield.